A kitchen is both the soul and nerve center of a house. It connects the family through cords of communication and cuisine. The Doyle family home in Holladay makes it a centerpiece as well. An addition proved to be the answer and she worked closely with architect Tristan Shepherd from Craft Architecture and Design and contractor Mark Haslam from Sausage Space. The project was no small feat. 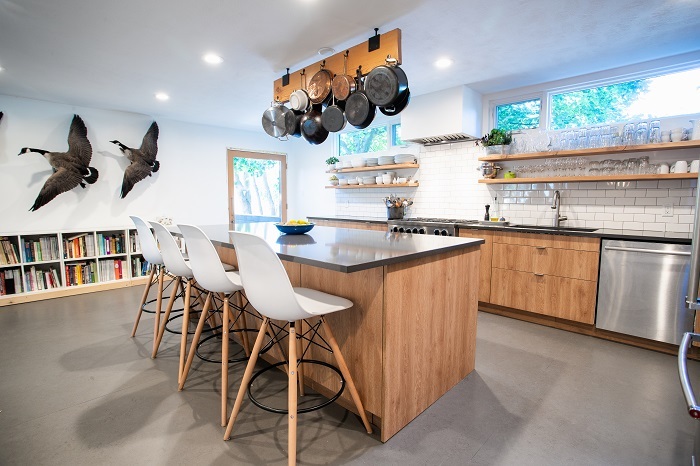 But when the major remodel was complete, the family had an extra 380 square feet upstairs, a new open floor plan, and that all-important kitchen. When asked about her favorite feature, Darby was unhesitating: “My range. It’s a BlueStar range; they’ve been made in Pennsylvania since the 1880s and it’s incredibly powerful, but you can also really step it back. I love it.” Also included on the list of favorites were the wall-mounted oven and walk-in pantry with its prep space, fermenting pots (for sauerkraut and kimchi), and a second dishwasher. The kitchen’s personal touches really make it shine. A long bookcase spanning one wall contains volumes Darby uses for research. 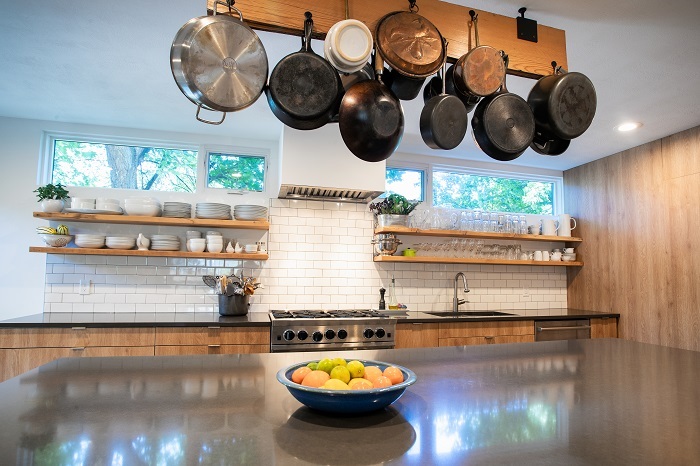 Above the island hangs the family collection of cast iron pans, including one given to Darby by her grandmother, who received it when she got married in 1936. That pan contains a lot of soul.